We had booked a standard room, which unfortunately smelt of stale tobacco, plus the room had a dividing partition in it which meant you couldn’t watch the TV from bed, not a big deal at end of day, but the smell was strong. We dumped our stuff and went for dinner in the hotel restaurant as we were starving by that point, then Sadie went to speak to reception about the room. We were happy enough to pay the extra few quid a night to upgrade to a bigger room, but after a quick conversation with the duty manager, she managed to get us a free upgrade to another room anyway, result! 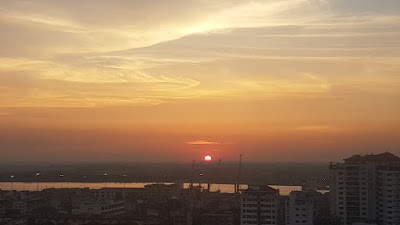 The next morning, we planned out a few things we wanted to do with our 4 days in Yangon, and one of them that was recommended in blogs etc. was to do the Yangon Circle Line. 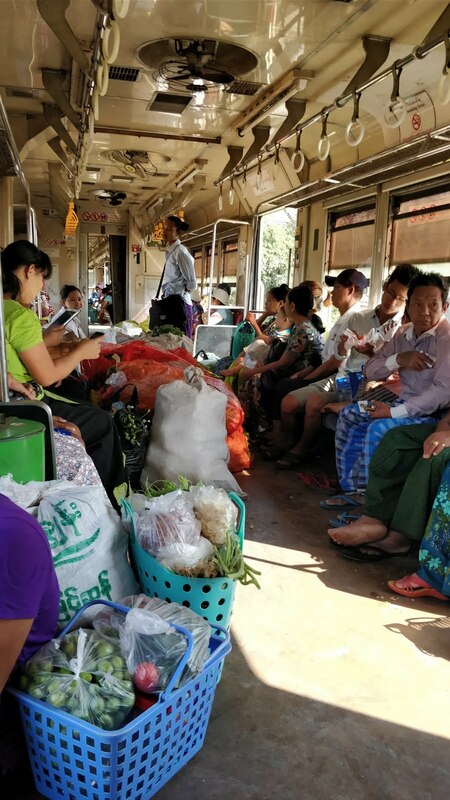 This route is a 39 station, 28-mile loop and provides a vital link in the transport system for the city, not just for getting local commuters around, but it also plays a huge part in the supply chain for locals to buy and sell local produce and transport it around to sell on and around the trains. The full circle which has trains going both directions takes around 3 hours, however we joined it around 5 stops in on the clockwise direction at a stop near our hotel. Buying the tickets was the easy part, and the small platform was full of locals who were going about their daily business sorting out baskets of fresh vegetables, chopping up full water melons to sell on the next arriving train (or to us!). We didn’t know where any of the trains were going, due to no signs in English or staff to assist us, so we jumped on one that was going the right direction, but after a few minutes the watermelon woman told us it wasn’t the circle one, so off we hopped at the next station with her and she put us on the right one. As we made our way slowly out to the suburbs, full scale markets appeared and new sellers would alight and sell their goods as others jumped off to restock. It was a fascinating journey into local life here and after around 2 ½ hours people watching, we got off near Chinatown. 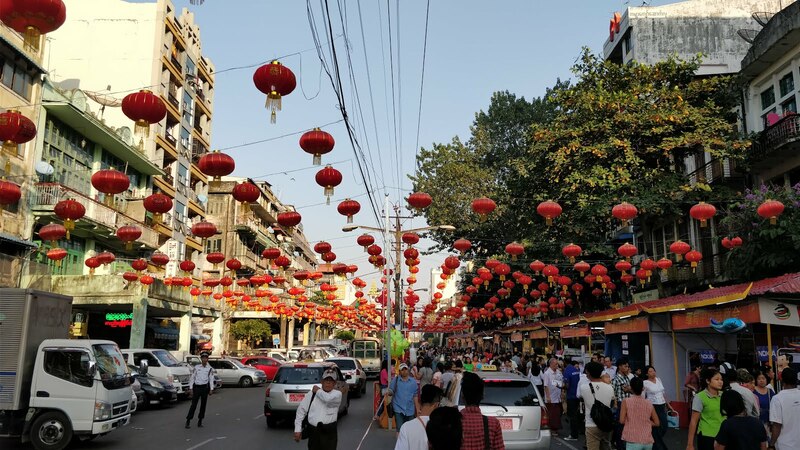 Our time in Yangon was over the Chinese New Year period and we had seen lots of the streets lit up with little Chinese lanterns whilst in the taxi, so we had planned to spend a night there enjoying all the celebrations. 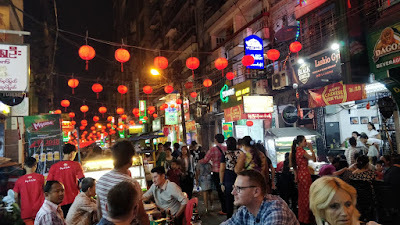 As we had arrived a little early, we found a small backstreet pub called the Double Happiness Bar and we went for a couple of drinks. 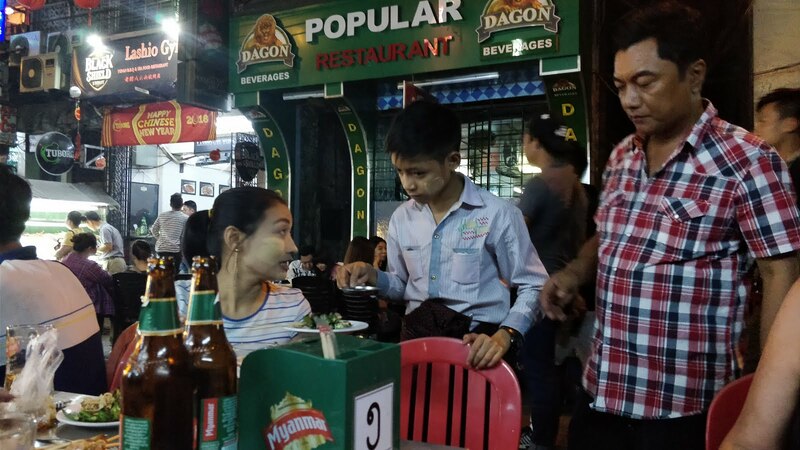 Well it turned out that most of the drinks on the menu were priced at 1000 kyat (£0.53), and so after several beers and cocktails later, we went off for a walk round more streets in the area. 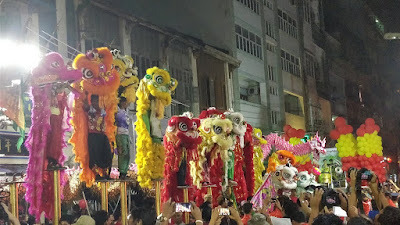 We discovered one street that had podiums set up for Lion Dancing, and we thought it started at 7pm, so off we went back into 19th Street (home of a popular street food area and the afore mentioned pub) as we were starting to get a bit hungry. 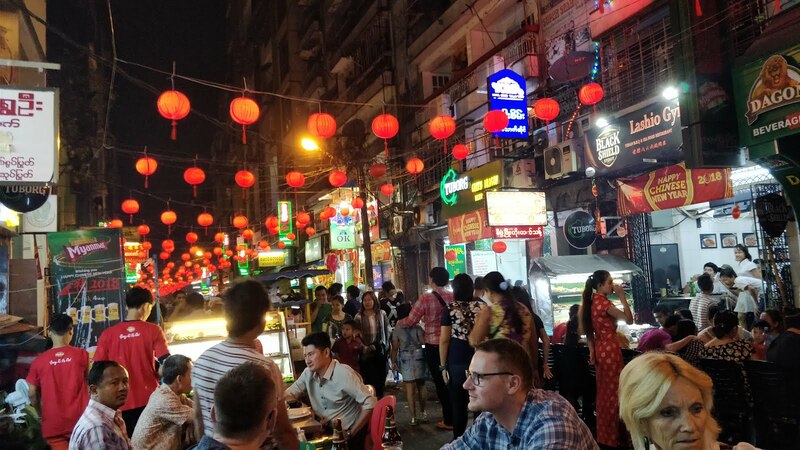 The street was mobbed as expected with no free tables to be seen, and eventually a couple of locals (Salai & Bawimana) shouted us over to join them at their table at one of the restaurants, which we kindly accepted. Turns out they were from Victoria Mountain in the North West of Myanmar and were studying here in Yangon, and provided amazing company for dinner helping us decide what to order and promoting their own little part of Myanmar which looks stunning. 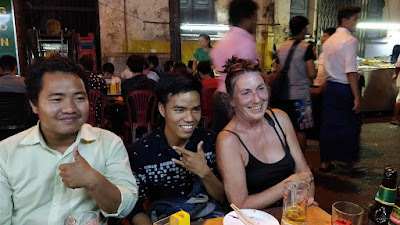 We were also sat beside a lovely lady called Colette from Belgium who was also travelling Myanmar and had been to many other places we planned to, so some helpful tips were passed on. Service all night was from a 12 year old boy called Mondeiha who was brilliant, he didn’t do a thing wrong and was laughing and joking with all the customers including us... amazing skills for his age and he got a good tip from us. Time flew past and by the time we were ready to go see the Lion Dancing, we had missed it... Oh well back to the Happiness bar it was then for yet more cheap drinks and the journey home was a bit hazy! 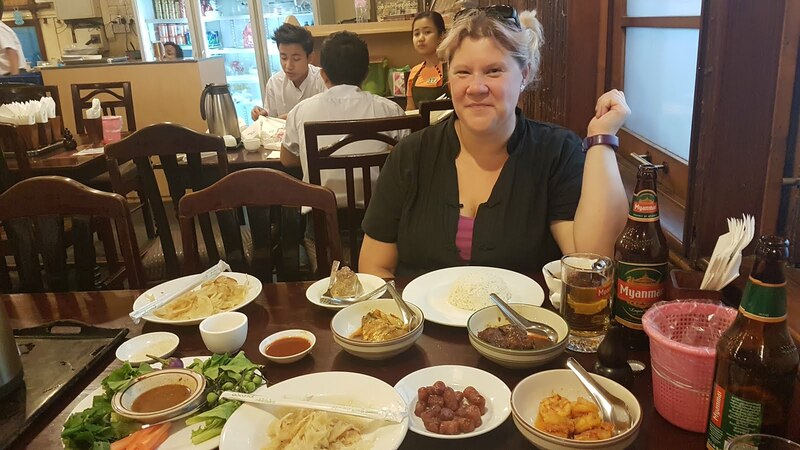 The next morning was a write off and eventually mid-afternoon we manage to crawl out of bed and found a local bakery which was delicious, and after we stuffed our faces with savoury snacks and cakes, we made another attempt to go see some Lion Dancing in Chinatown. After one quick beer this time, we went around to the street it was being held in for 6pm, and it was already getting busy due to it being in a small side street that had been closed to traffic. As time passed, more and more people arrived and 7pm came and went and all that was happening was an opening ceremony and a lot of talking over the PA system. It approached 8pm and with the crowd so packed you couldn’t move, one girl near us collapsed. She was quickly helped by people around her and managed to get out. 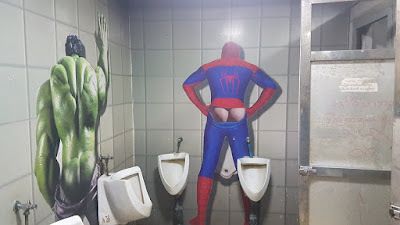 Now I am used to large dense crowds due to my work history, but this was very busy and with no available water or any kind of crowd control (unless you were a VIP or Press), then I didn’t want to wait any longer, plus I needed the toilet. I left the crowds and Sadie waited another 10 minutes for the actual dancing to begin, got a few photos and quickly came and joined me. Now hungry again after waiting over 2 hours for the dancing, we went and got some delicious Sushi which was a new thing for me to try which I enjoyed, and then we got an Uber back to the hotel. 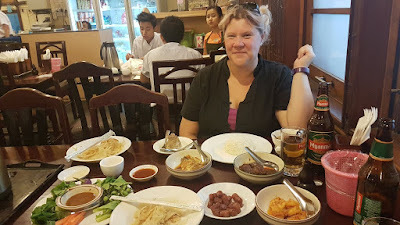 Most of our journeys around Yangon were done using Uber, it was so cheap there and easy to book with no long waits either and paid directly using my Revolut card. 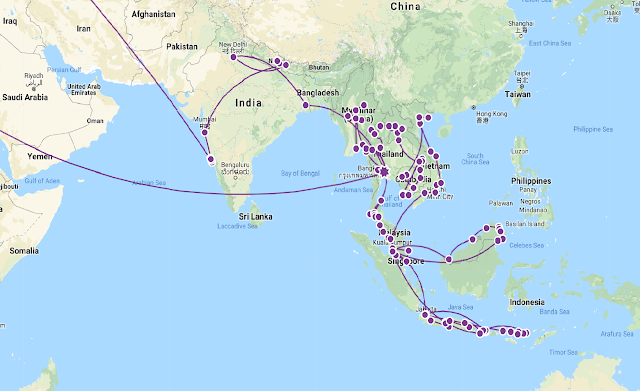 Of which I still haven’t had a new card sent as they don’t deliver replacements to Myanmar, so I need to wait till in Thailand to get it and have had lengthy chats to their support about the whole saga. 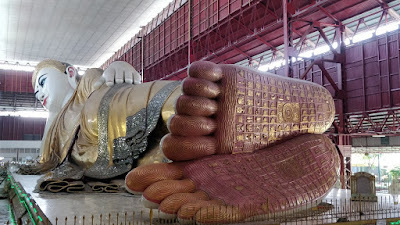 We got up and headed out early the next morning and went around 3 of the main temples in Yangon, including the Chauk Htat Kyi pagoda that houses a massive 66 metre reclining Buddha, and the famous Shewdagon Pagoda. The heat in Yangon mid-afternoon was around 35-37° so we went back to the hotel and waited till about 5pm before going back out. 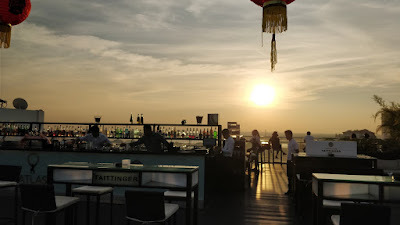 I had found a nearby roof-top bar which was meant to be good for sunset, so we headed there. 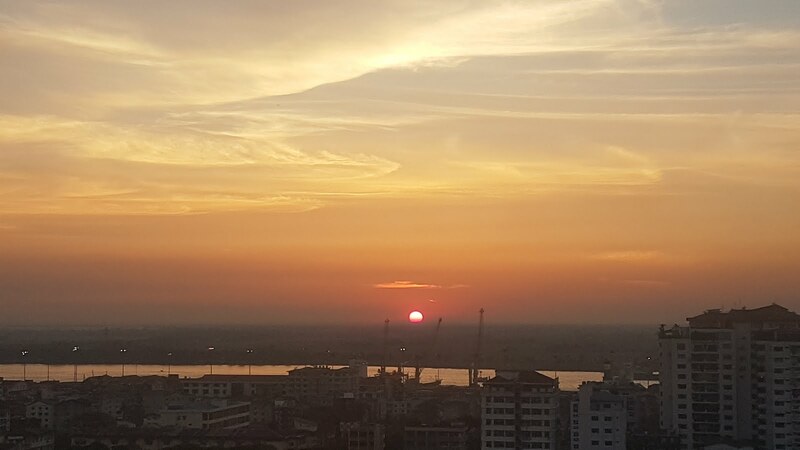 It was only 12 floors high, so whilst not the tallest around, it did have a good view over the river and of the Shewdagon Pagoda too. It also did delicious cocktails and free nibbles so we sat and waited for the sun to set. And what an amazing one we got, as I posted on Facebook at the time, we had travelled 11 weeks and 3 countries, took hundreds of pics, but this was the best one yet... words and pictures can’t describe how beautiful it was as the sun dipped down below the horizon and the sky was lit up with so many amazing clouds and colours. 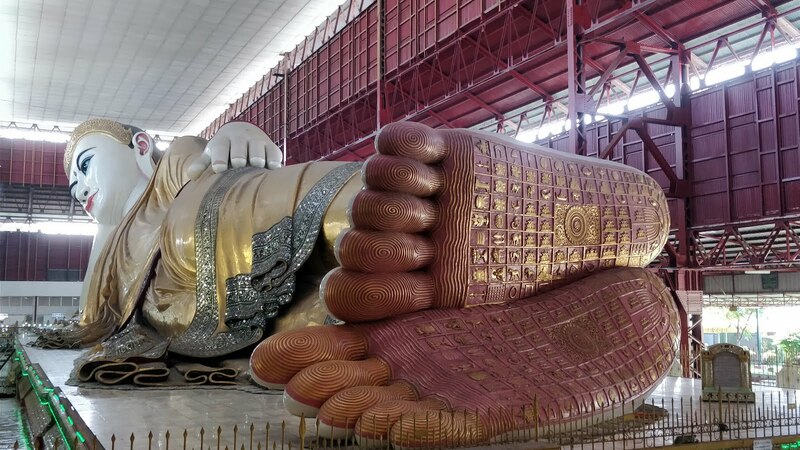 Our last day in this great city was spent with me going to an actual launderette in the morning, whilst Sadie looked at North Thailand a bit more since we go there in just over a week, well that was the plan but that looks to be changing... more on that later though! In the early afternoon we wanted to visit the National Museum, so we got an Uber there to discover it was actually closed on Mondays, and since it was full on 38° by this time, we went to the nearest pub to hide for a few hours. 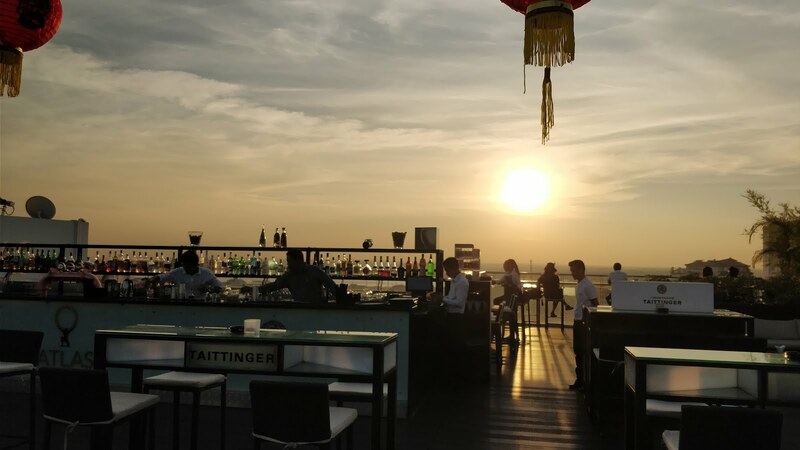 We also found a nice place for food where you go up and select what you want from all the dishes laid out like a buffet, but they then come and serve you it at the table. We had no idea what we were even pointing at, but it all turned out ok.
We then found a small amusement park called Happy World, but sadly it was mainly for kids. 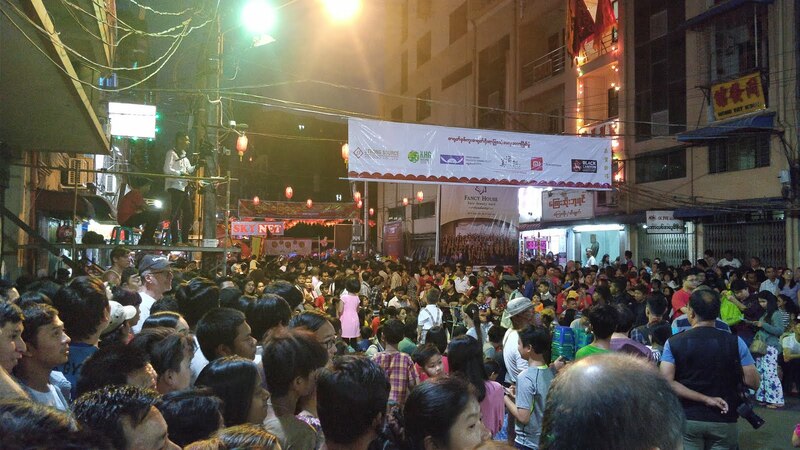 They wanted 1000 kyat each to enter, but waived the charge when we said we just wanted a walk round. The only thing worth going on was a Ghost Train ride which was quite amusing as things jumped out and touched against you on the way round. I went to the use the toilet before the journey back to the hotel, however the images painted on the gents toilet wall were slightly disturbing! Then it was time to head back to the hotel for an early night, as we had another dawn rise for our next train in the morning to our next destination, Golden Rock.